This year SE Uplift staff committed to participating in the Point-In-Time count. Four staff members spent over 20 hours of staff time training for and collecting data for the Point-In-Time count. SE Uplift staff collected data from neighbors at the Central Library, Midland Library, and St. Francis Church. SE Uplift is proud to continue aiding the local government in responding to the housing crisis in our community. 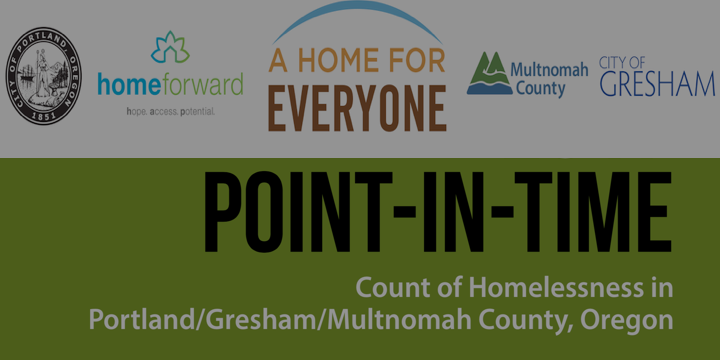 Point-In-Time counts provide a snapshot of people experiencing homelessness in Multnomah County on any given night. These counts are conducted on a bi-annual basis and include people sleeping in cars, outside, in abandoned buildings, as well as those sleeping in shelters. 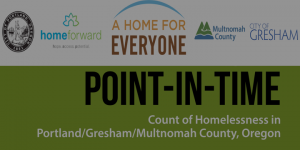 The Point-In-Time counts can be viewed on the A Home for Everyone website. Point-In-Time counts provide information on the number of people that were unhoused in our community on a particular night. Surveys are conducted by social services agencies, Multnomah County staff and community volunteers. Volunteers are trained to provide outreach in various locations where unhoused community members congregate and conduct surveys on their housing status on the night of Wednesday, January 23rd, 2019. This data ensures continued funding from the state and federal government for Multnomah County, City of Portland and non-profit partners to continue housing and social support for unhoused neighbors. The last count was conducted in 2017; overall the data showed that homelessness increased since the previous count in 2015, but the results also showed that more people were gaining access to temporary off-street shelters. Click here to read an in-depth analysis of the data collected in 2017. Data collected in 2019 will be available on the A Home For Everyone site in 2-3 month.